MANILA, Philippines- A certain Hera Adriana Cai Consunji has alleged the government of using voter’s personal information obtained from the hacked website of the Commission on Elections (Comelec) in order to produce a fake “Yes to Mar” I.D. 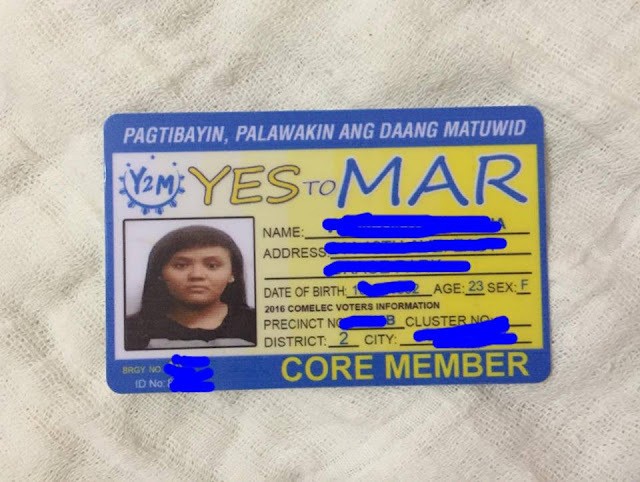 Netizen gets fake “Yes to Mar” I.D"? Consunji insisted that her personal information were obtained from the Comelec website since the photo used in the I.D. was her photo captured in the Comelec office in her city 6 years ago. While the said I.D. came in just a month after the hacking of Comelec website, Consunji is still awaiting her long overdue voter’s I.D. A supporter of Davao City Mayor Rodrigo Duterte, Consunji revealed that the incident has made her lost her respect for the current administration. “Napakadungis at napakadumi ng halalan ngayon at dahil sa pangyayaring ito mas lalo lang akong nawalan ng respeto sa kasalukuyang administrasyon,” she wrote on her Facebook post. On March 27, the hacker group Anonymous Philippines hacked the Comelec website and urged the poll body to implement the security features of the PCOS machines. Barely a month after the hacking incident, another hacker group, LulzSec Philippines, claimed that they launched a search engine of leaked personal information of roughly 55 million Filipino voters. Paul Biteng, a 23-year-old Information Technology graduate, was arrested for apparently hacking the Comelec website. According to his counsel, lawyer Harold Alcantara, Biteng was not responsible for the defacement of the Comelec website or the leak of the personal information of register voters. A P600,000 bail was recommended by prosecutors for the temporary release of Biteng.